For many women, a home pregnancy test is the first indication they have of being pregnant. Unfortunately, sometimes these tests can return a false negative result. In other words, the test may say “not pregnant” when in reality you are pregnant. Sometimes a test can also return a false positive result, detecting pregnancy where none exists, but false negative results are much more common, with as many as 9 out of 15 women testing negative until seven or eight weeks. How does this happen? What could cause a pregnancy test to return a negative result when you are actually pregnant? One reason a pregnancy test may return a false negative result is that the test is simply taken too early in the pregnancy to properly detect the presence of a developing fetus. The sooner after a missed period a home pregnancy test is taken, the harder it is for the test to detect the pregnancy hormone human chorionic gonadotrophin, or hCG. Every test is different, and some are more sensitive than others. A pregnancy test can usually detect hCG levels within 10 days of a missed period. Some tests can detect hCG even earlier, within a week of conception, but no test is 100% accurate. Another reason you may receive a false negative on a home pregnancy test is that hCG levels vary from person to person, and your individual hCG level may be too low to be detected on a home pregnancy test. If your home pregnancy test comes back negative after a missed period, wait one week and retest. Some women may take up to three weeks after a missed period before a detectable level of hCG is produced. A negative result from a home pregnancy test does not unconditionally rule out pregnancy or ectopic pregnancy. A third reason for a false negative result on a pregnancy test is diluted urine. If you drink a lot of water, it will dilute the hCG in your urine, and could cause you to get a false negative. Test your urine again upon rising in the morning, as this urine will have the most concentrated amounts of hCG. It’s also possible to experience symptoms normally associated with pregnancy such as mood swings, swollen breasts and food cravings, which may be caused by PMS rather than pregnancy. On the other hand, you might experience what appears to be a menstrual period, even though you are pregnant. If you are having some vaginal bleeding but suspect you might be pregnant even though you have received a negative result from a home pregnancy test, it’s time to talk to your medical provider. Your doctor can conduct urine and blood tests to help determine if you are pregnant. Although it’s less likely, it is still possible to be pregnant even if urine and blood tests come back negative. If you still believe you are pregnant after receiving negative urine and blood test results, your medical provider can perform a transvaginal ultrasound to determine whether you are pregnant. A pregnancy in your uterus should be visible six weeks after your last menstrual period. If there are no signs of an embryo or fetus in the uterus and your hCG levels are elevated or rising, an ectopic pregnancy could be the culprit. 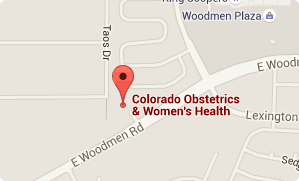 At Colorado Obstetrics and Women's Health in Colorado Springs, we care for women at every stage of life, from the child bearing years through menopause and beyond. We offer women complete prenatal and obstetrical care, for both routine and high-risk pregnancies. If you are looking for a caring OB/GYN who will work with you to achieve and maintain your best possible health at every stage of your life, give us a call today at (719) 634-8800 to schedule an appointment with one of our friendly women’s health professionals. We look forward to helping you achieve your best health, and live your best life.